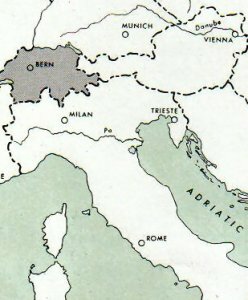 This archive is about my father, 1905-57.
and served in Italy and Austria in WWII. 17 Jan 1957 4.55pm Died. The bombing of Electra House. ----- 14 Jun 44 Expecting arrival of "Mary"
----- 07 Aug 44 Wets baby's head in champagne. Win and Frank nagging. 043 22 Feb 45 Piazza Navona, Fountain Bernini, Moses, St Peter in chains "dove se trova il Piazza Navona"
094 27 May 45 Americans, the Future (Bern and Ena's). by Cliff Lord, Graham Watson, pub. Helion & Company Limited, 2004 - Biography & Autobiography - 416 pages. 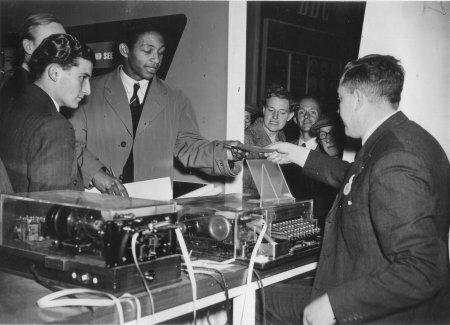 Cable and Wireless Limited, a British world wide telecommunications company, sent a Mobile Wireless Assembly (MWA) to Algiers in 1942, which was comprised of five vans and a trailer manned by nine operators and three engineers. Known as the "Blue Train", the MWA operated during the remainder of the British campaign in North Africa, and was then attached to the Public Relations Office of the British Army for the invasion of Southern Italy in late 1943. 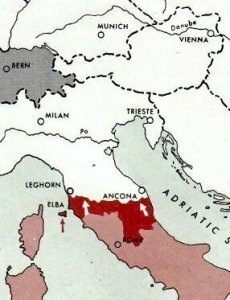 During the fighting in Nprth Africa and the early stages of the Italian Campaigns, Cable and Wireless staff suffered the shared risks, discomforts and frustrations of servicemen in the field but without any formal claim to the support of the armed services with whom they worked in close association. While the acquisition of food and accommodation presented the MWA staff with particular problems, as civilians in plain clothes, they faced the greater and very real risk of being treated as irregular soldiers if taken prisoner by the enemy. In order to rectify this situation, Cable and Wireless proposed to the Army Council that those of their staff who were working in forward areas should be enrolled in a uniformed organisation supported by the Services. Agreement was reached, and a mutually advantageous Telecom Charter was drawn up. This Charter provided the Cable and Wireless staff with the protection of Article 81 of the International Convention. Thank you both very much for your donation to the museum. regarding the Blue Train that I thought might be of interest to you both. including the preface from the book. 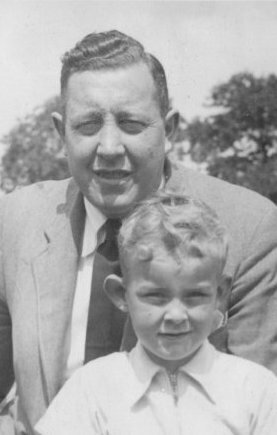 Thank you so much for all the information you have sent me about my father. this to my brother, digest it, and put it in an easily accessible form. Next time I'm in Cornwall, I shall put Porthcurno at the head of my "Must-see"
list. Menwhile, thanks again for your great kindness. cards on which the rest of his record is continued. this is from 1946, but it gives you an idea of what it was like. archives to find and send us anything about Dad or the Blue train. �60 each, if we could get into a B&B. it mentions the Blue Train. Unfortunately page 392 in missed out. died in service in 1957.
at Mercury House until his death in  1957 aged 51.
reached Vienna in early May 1945.
in Italy and Vienna, and get an idea of what the "Blue Train" was. As a provider of telecommunications services in more than 50 countries around the globe, Cable and Wireless plc is a leading player in a rapidly growing and evolving industry. Its operations in the late 1990s were concentrated in three major areas: the United Kingdom, the Caribbean, and Asia. The company, whose fortunes once depended on telegraphic connections between the various parts of the British Empire, operated in the late 20th century all over the world, using equipment that even Guglielmo Marconi, the inventor of the wireless and one of the company's first directors, could not have imagined. The history of the companies that became Cable and Wireless plc began in 1852, when a Manchester cotton merchant named John Pender joined other businessmen from the north of England on the board of the English and Irish Magnetic Telegraph Company, set up to run a telegraph cable service between London and Dublin. This was only two years after the first submarine cable had been laid, between England and France, and coincided with the first laying of cables in India, then Britain's largest overseas possession. Pender next became a director of the Atlantic Telegraph Company, whose first cable to the United States was laid in 1858 but failed to function properly. Six years later, when it became clear that the company could not afford to make a second attempt with its own resources, he was instrumental in creating the Telegraph Construction and Maintenance Company (Telcon) through a merger of the two leading cable-making companies, under Pender's chairmanship. However, the second cable broke and fell into the Atlantic during the laying stage in 1865. Pender and his colleagues had to set up a successor to the Atlantic Telegraph Company, the Anglo-American Telegraph Company Ltd., on behalf of which Telcon not only retrieved the 1865 cable but successfully constructed and laid a transatlantic cable in 1866. In 1868 the British government decided to buy up all the inland telegraph companies, including English and Irish Magnetic, a process completed in 1870, but left overseas telegraphy in private hands. In 1869 John Pender created three more companies. The British-Indian Submarine Telegraph Company and the Falmouth, Gibraltar and Malta Telegraph Company completed the cable system between London and Bombay in 1870, while the China Submarine Telegraph company set about connecting Singapore and Hong Kong, Britain's main possessions in East Asia. Pender's other company, Telcon, supplied cable not only for these ventures but also for a cable from Marseilles to Malta, which provided France with a link to its colonies in North Africa and Asia. When the governments of South Australia and Queensland, Australia, decided that the monthly steamships between Australia and Britain were too slow a means of communication, it was John Pender whom they invited to fill the telegraphic gap between Bombay and Adelaide, Australia. The All-Sea Australia to England Telegraph, supplied by Telcon, was opened in 1872. It was operated in two sections, Bombay to Singapore by the British India Extension Telegraph Company and Singapore to Adelaide by the British Australian Telegraph Company, both under Pender's control. Pender now set about reorganizing his cable interests. First, in 1872, came the amalgamation of British Indian Submarine, Falmouth, Gibraltar and Malta, and the Marseilles, Algiers, and Malta companies with the Anglo-Mediterranean, which had been created in 1868 to link Malta, Alexandria, and the new Suez Canal. Pender became chairman of the Eastern Telegraph Company that resulted from their merger. Next, in 1873, he presided over the merger of his Australian, Chinese, and British India Extension companies into the Eastern Extension Australasia and China Telegraph Company. It was also in 1873 that Pender created a holding company, the Globe Telegraph and Trust Company. The holding company's investors received portions of shares in the operating companies, chiefly the Eastern Telegraph and the Anglo-American. All the companies so far named remained within the Eastern Telegraph group, except Anglo-American, which was taken over in 1910 by a U.S. firm, Western Union. Finally, 1873 also saw the creation of the Brazilian Submarine Telegraph Company, which had several directors and shareholders in common with Eastern Telegraph and opened a cable from Lisbon, Portugal, to Pernambuco, Brazil, in 1874. Between 1879 and 1889 Pender's group added Africa to its list of cable routes through three companies, African Direct, a joint venture with Brazilian Submarine; West African, incorporated into Eastern Telegraph; and Eastern and South African. In 1892, following the expiration of the telegraph concession operated by Brazilian Submarine, that company and its main rival, Western and Brazilian, formed a new venture, the Pacific and European Telegraph Company, to renew the concession and link Brazil with Chile and Argentina. Having helped to arrange this operation, Pender became chairman of Brazilian Submarine in 1893, further reinforcing his position as the leading figure in the worldwide cable business. John Pender died in 1896; his successor as chairman of Eastern Telegraph and Eastern Extension was Lord Tweeddale, while Pender's son John Denison-Pender, later Sir John, continued as managing director. The last stage in restructuring the set of companies Pender had been so instrumental in creating came in 1899, when Brazilian Submarine, having absorbed two other London-based telegraph companies operating in South America, was renamed the Western Telegraph Company. The first confrontation between cable and the new medium of wireless ended in acrimony. 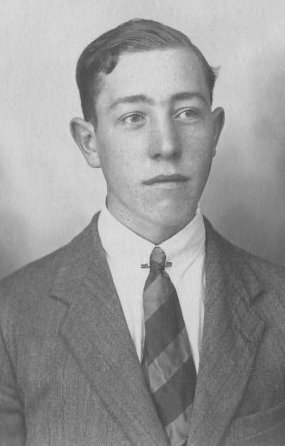 Guglielmo Marconi's success in sending a signal from Cornwall to Newfoundland in 1901 was soured when the Anglo-American Telegraph Company, part of the Pender group, forbade any further experiments, since they would infringe on the Pender group's monopoly of communications in Newfoundland. Marconi moved his work to Nova Scotia, and found Americans and Canadians generally more receptive to his achievement than Europeans. Certainly the Eastern Telegraph group remained unimpressed, citing lack of privacy, lack of speed, interruptions, and mixing of messages as decisive disadvantages of wireless compared with cable. Even so, the management was cautious enough to have a mast secretly installed at its Cornwall station with which to listen in on Marconi's experiments and, on at least one occasion, to disrupt a demonstration of wireless transmission. In 1900 the governments of Britain, Australia, New Zealand, and Canada had agreed on the joint financing of a Pacific Cable, for which the construction contract was won by Telcon. The project began 21 years after it had first been proposed by Sandford Fleming, the chief engineer of the Canadian Pacific Railway. It eventually involved the laying of the largest single piece of cable so far--4,000 miles, out of a total Pacific Cable length of 7,836 miles--but was completed ahead of schedule, in October 1902. Alarmed by this competition from public enterprise, the Eastern Telegraph group reduced rates on its cables in 1900, and laid a cable across the Indian Ocean to serve the three Australian states--South Australia, Western Australia, and Tasmania--which had refused to join the Pacific project. Throughout World War I all cable services out of Britain were controlled by the government. The Eastern Telegraph group profited enormously from the diversion of business to India and East Asia away from the German-owned overland routes and from the general use of telegrams in preference to letters, which were delayed by lack of civilian shipping. For the first time cables became targets of warfare in themselves. Eastern Telegraph, the British Royal Navy, and the British General Post Office collaborated on cutting all cable links between Germany and North America. The Germans temporarily disabled both the Pacific Cable and the cable across the Indian Ocean, by attacking island stations in each ocean. However, the most spectacular event of the first "cable war" came in 1917, when, following the United States' entry into the war, the German cable that had been cut three years before was lifted out of its position between New York and Emden, Germany, moved to a new position between Nova Scotia and Cornwall, and taken over by the British government as a prize of war, to be operated by the General Post Office. In 1920 the government decided to keep this cable, despite U.S. protests, and to purchase a second line, the two together being renamed Imperial Cable. The wartime boom in Eastern Telegraph group's business gave way to slack trading in the early 1920s, as government telegrams declined in number and length, overland rivals got back to work, and the Pacific and Imperial Cables became direct competitors for communications with North America and Australia. However, the biggest blow to the whole cable business was struck once again by Marconi when he succeeded, in 1924, in telephoning Australia from England on short-wave radio equipment. This latest kind of wireless worked faster, cost less, and used less energy than either long-wave radio transmission or cable, and offered a flexibility its rivals did not then have, since it transmitted both telephony and telegraphy. Five years later the Marconi-Wright facsimile system added picture transmission to wireless's advantages. Within six months of its establishment, the General Post Office's system of short-wave stations had taken 65 percent of the Eastern Telegraph group's business, as well as more than 50 percent of Pacific Cable's, and its service cost a fraction of the price of cabling. In the meantime, however, the cable systems were given a new lease on life, from 1925 onwards, as manual re-transmission of messages, at points where the signals weakened with distance, gave way to far less time- and labor-intensive automatic regeneration, using a system devised by Telcon. At the suggestion of the private Marconi company, which operated separately from the G.P.O. but under a G.P.O. license, Sir John Denison-Pender met its chairman, Lord Inverforth, in December 1927, to decide on a joint response to the Imperial Wireless and Cable Conference called for the following month. In March 1928 they both signed a letter to the conference proposing a merged holding company, owned 56.25 percent by the Eastern Telegraph group's shareholders and 43.75 percent by Marconi's. This was against the wishes of the father of wireless himself, who had lost the chairmanship of his own company the year before. But the conference accepted this plan. On April 8, 1929, two new companies began trading. One, Cable and Wireless Limited, had two functions: first, to control all the nontraffic interests, such as patent rights and manufacturing, and secondly to hold all the shares in the cable companies and Marconi. They, in turn, were exclusive owners of the second company, Imperial and International Communications Limited, which owned and operated the actual cable and radio stations, cables, ships, and other assets of Eastern Telegraph and Marconi, as well as the U.K. government's Imperial and Pacific Cables and, on lease, the Post Office transmitting stations. In 1934 the companies were renamed, respectively, Cable and Wireless (Holding) Limited and Cable and Wireless Limited. From the outset they were controlled by a single board, known, on the model of the Bank of England, as the Court of Directors, as Cable and Wireless's board still was in the early 1990s. Since Sir John Denison-Pender had died one month before the companies started up, it was his son John Cuthbert who became governor, and Lord Inverforth sole president of the Court. The Great Depression hit the new companies badly. Between 1929 and 1935 the number of chargeable words carried fell by more than half, and net profits, just over �1 million in 1929, declined to �75,000 in 1931 and reached only �625,000 in 1934. By 1933 the work force had been reduced by about a third and the introduction of telex in 1932 helped to cut operating costs. 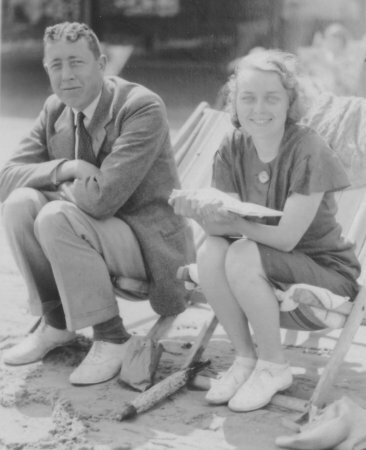 Competition was intensifying, as U.S.-owned International Telephone and Telegraph Corporation (ITT) expanded worldwide and Imperial Airways built up its inexpensive air mail service with subsidies from the same governments whose 1928 conference had led to the creation of Imperial and International. Some expansion of the cable and wireless businesses did occur, however, with the acquisition of wireless concessions in Southern Rhodesia--(now Zimbabwe), Singapore (replacing the old Bombay-Rangoon cable), Turkey, and Peru, as well as domestic telephone services in Turkey, Cyprus, and Hong Kong. The structure agreed for Cable and Wireless in 1928 was altered slightly ten years later. In return for giving the company ownership, rather than rental, of the short-wave radio system created by the General Post Office, the British government took shares in the company for the first time, although for the time being it waived its right to appoint a director to the Court. At the same time an empire flat rate scheme was introduced, cutting the company's prices to the public and improving its finances. World War II revived the cable war of 1914-1918. 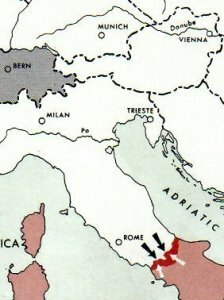 In 1939 German-owned cables across the Atlantic were cut once again, and in 1940 Italian cables to South America and Spain were cut in retaliation for Italian action against two of the five British cables linking Gibraltar and Malta. Electra House, the company's head office and central cable station, was damaged by German bombing in 1941. 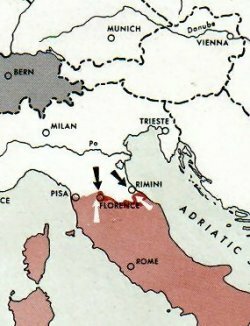 However, the company made a considerable contribution to the Allied war effort, supplying, for instance, the wireless equipment with which the North African campaign was conducted in 1942, and sending staff, in army uniforms marked with Telcon flashes, into several campaigns, starting in Italy in 1943. In Britain the end of the European war was followed by the election of a Labour government on a program that included expanding state ownership of leading industries. With the consent of the governments of the other independent countries in the Commonwealth— the former British Empire was then to be known--Cable and Wireless was put on the shopping list, although the holding company and the main assets--cables, ships, and wireless stations--were not. All shares in Cable and Wireless were transferred to the government on January 1, 1947, while Cable and Wireless (Holding) became an investment trust. In 1948 the company made an agreement with the government of Hong Kong to provide external telecommunications for the colony. In 1950, following another agreement among the Commonwealth governments, most of Cable and Wireless's U.K. assets and staff were transferred to the General Post Office, just as parts of its assets overseas were acquired by governmental bodies in the other countries involved. Even so, Cable and Wireless remained the largest single international telegraphy enterprise in the world, with 186,000 miles of submarine cable still converging on a station at Porthcurno in Cornwall, England, that had been opened in 1870. By the time the station closed in 1970, the company's business had been transformed. As telegraphy became obsolete in the 1950s, the development of coaxial voice transmission offered the chance to switch over to telephone cables. became the accommodation for the Eastern and Associated Telegraph Companies. 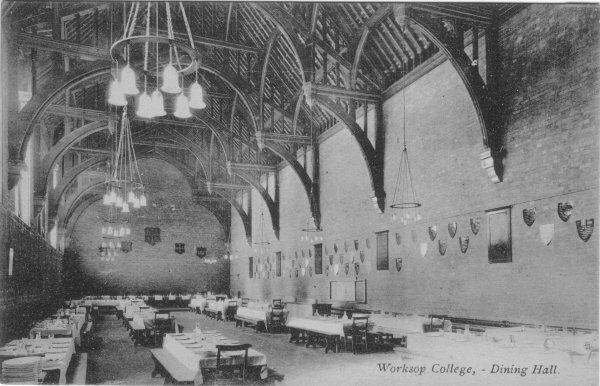 Housed in two rooms in the basement was the company�s London training school. new building on the Victoria Embankment, which had been opened on May 11th. In 1944 Electra House was hit by a V1, which destroyed the Chairman's flat. 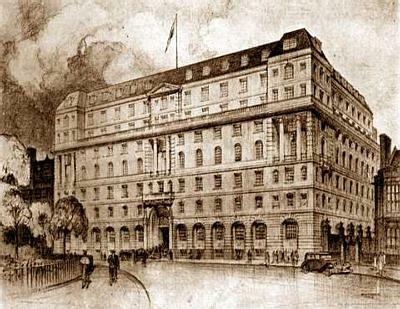 the war, when the duties were transferred to Electra House, Embankment. one hundred cable sensors, could take over. similar station from Woburn, as �Mr. Turner�. to print 10 million, at 6d. per 100. Ena Palmer (nee Doxey) Memories 1928. 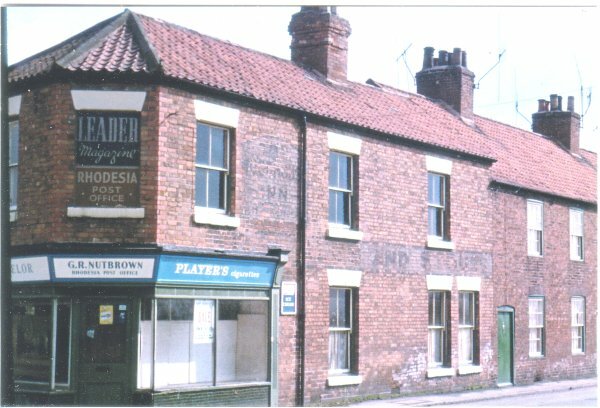 Angel Street until the 1960's]. [club has been there since 1915]. for Christmas 1929. We had a lovely time. I knew with a very public school accent! It was the best time of my life! Highbury Park Rd to Moorgate St]. I did not work, women were not supposed to work after marriage. it was better to pay £850 for the house than £1.60 a week rent. John, draft version number 1 for CBP, Robert. he said a word to me). it was not an uncomfortable preoccupation. using the word in front of his mother. (probably of old age). Dad said "typical John was there". put his hand up Mum's dress. She used to tell him off. money (male attachments) but of course I was too shy. sure he was aware of his mortality. and was smitten with Petula Clark on TV. Dad heard it as he was listening to the radio at the time. and ill to come and get me). to Twickenham station and we caught the train to Waterloo. get the train straight back to Twickenham by myself. funeral at All Hallows Church. didn't take me which upset me greatly. loud murmur and a palpable thrill. obviously not fit for a surgical repair. about 300 miles, about 200 lorries, July 1945.
on 18 Mar 1944 destroying 4 villages and 88 US warplanes. very shortly. Goodness knows when we are going to settle down. walking about in shorts and shirt - good job I brought 'em. .......All I have done so far is work and sleep and go for long walks. walk another 15 minutes, and all the walking seems to be up and down steps. walked down to the harbour - steps every bit of the way. .......There are peaches and grapes growing all over the place here. have steps. There is no furniture - but who minds that - nothing to spoil. so far are leaving shorts and sandals behind. ......There's a NAAFI store here where I have bought a few things. only meal I bother about. ......I could have brought lots more things with me without any bother. but they take about 10 days I believe. John and Robert so long as we don't try to force anything on to the. Here I am at last. I arrived here last night and couldn't see much of course. 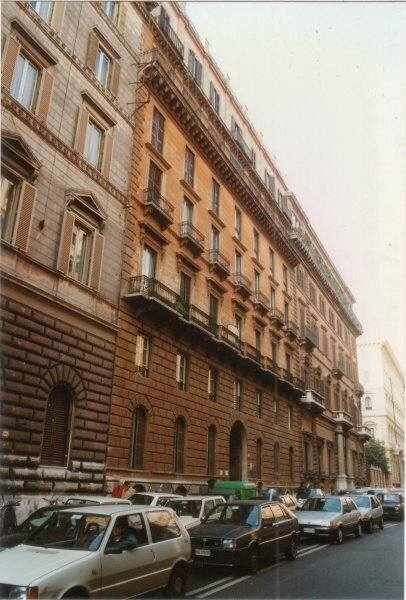 My first impression of Rome is that it is awfully cold. .......We had a good journey in a bus starting at about 10am. blown up and mended. It has been most interesting. I'm glad I have not missed it. another, and handkerchief headwear of another. upset you. It doesn't upset me at all, although I would love to stay here. because we are fed up with the office here, and Jim, Jas Bolton & I are to go. of the place we are going to. That's the nearest place I know. about a lot, but anything rather than Colombo. Tell John & Robert all about it. I was for it. It was awful waiting to hear who the other two were. .......I've had to stop to do a bit of packing. .......I suppose we shall be away by 6 in the morning. got to put that in! What a game. We are simply running with sweat. .......And we knew nothing about this two days ago! Its always the way. two away in St Veit Gassa Heitzing and arevery comfortable at the moment. own transit rations. Breakfast is porridge, spam, beans, biscuits and jam. tea at each meal fortunately. But this kind of feeding does blow us up. Even I shall be pleased when we get a few fresh vegetables and fresh meat. people were going backwards and forward with all their belongings. territory and come streaming past - only to go back again ten minutes later. yesterday - so she managed it somehow. I did feel so sorry for them though. luggage in the middle and then she could dash up and down a bit faster! and saw more butterflies in half an hour than I have ever seen in my life. 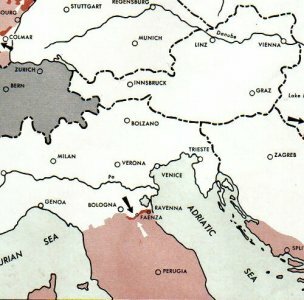 of us managed to get to Vienna. The rest of the lorries were turned back. first fortnight we had nothing but bullybeef and hot strong sweet Army tea. We had to work in a garage where everything had been blown up and destroyed. In the end we found some very nice quarters in Heintzing. he said either but it finished up with him bending down and kissing my hand. firearms line. That was before we got our part of Vienna to look after. much of an opinion of them. Maybe that is because I don't understand them. fond of wrist watches. So long as they are very ornate they are happy. Viennese say that it is full of wrist watches the Russians have liberated. everlasting mucking about away from home is enough to finish anybody off. 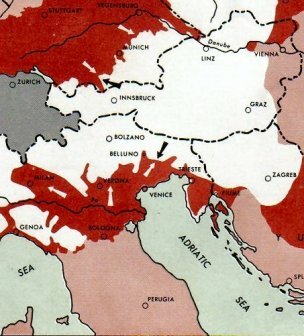 Vienna was taken in the Vienna Offensive of the Red Army on April 13. 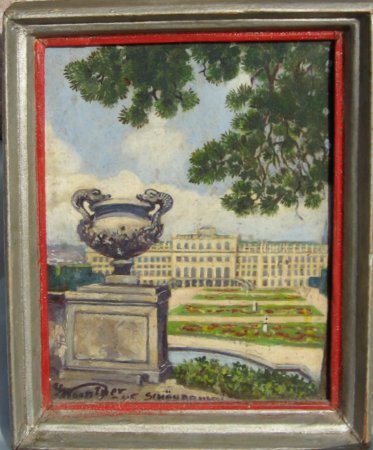 Schoenbrunn Palace, being used as their HQ. of public and private buildings and the infrastructure destroyed or damaged. again in 1955 after years of reconstruction and restoration. sectors, and contingency plans were drafted by the authorities. The Third Man and by the movie which followed in 1949.
the orders of military Commanders in Chief. 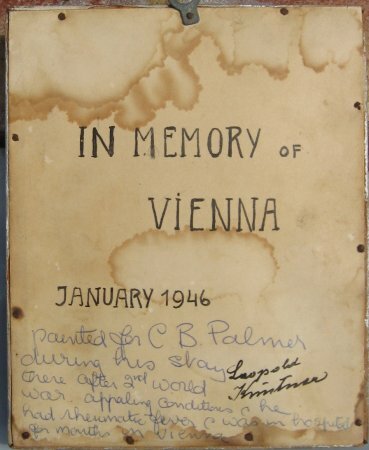 "painted for C B Palmer during his stay there after 2nd World War. 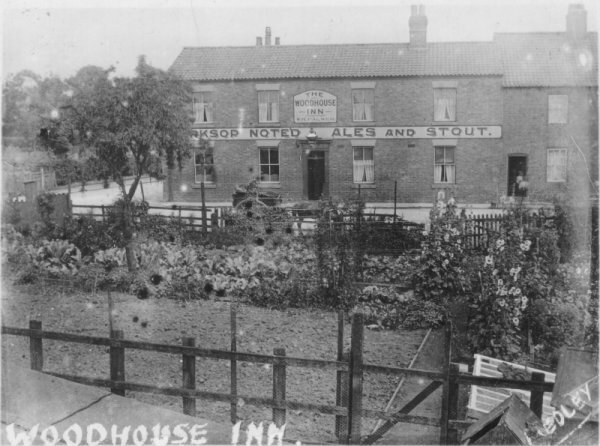 The Woodhouse Inn c1923, Woodend, near Worksop, Notts. C.B.Palmer was born in 1905 at The Woodhouse Inn. Arnold Medley of Huddersfield, WHP's nephew. born at the old Inn. A pony and trap can be seen outside the main door. when young but was rescued. to Tylden Road about then. 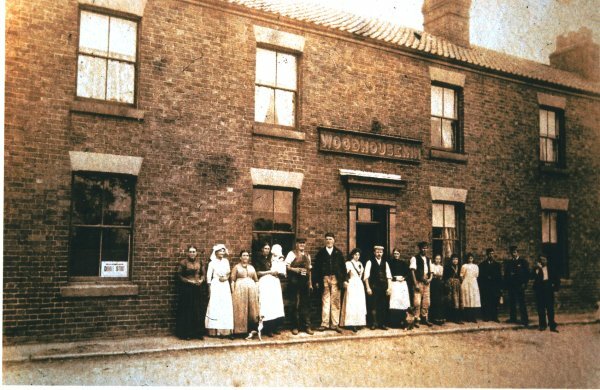 The Woodhouse Inn, c1900. None of the folk are Palmers. Sign in window reads "Double Stout". following his brother GWP (1911-1917); they were both in Pelham House. 5 years, probably because of the death of his father in Jul 1922.
are spectacular; the original design was based upon Westminster Abbey. be found many carvings of Old Boys from the time Worksop was opened". and copyright © 2010, John Palmer,  All Rights Reserved.